I don't write much on the gas plant relocations - my intention having written my thoughts was to move on. This post isn't about the gas plant issue; it's about a politician communicating only to mislead - which I increasingly think is the purpose of most of Premier Wynne's "conversations." I read a tweet yesterday from the incurious Globe and Mail Queen's Park Reporter, Adrian Morrow, which reported Ontario's Premier as saying "There is no way to know those costs." One implication being there were actual costs to know, and a second being they weren't knowable. On September 29th, 2009, the OPA announced, "it will sign a contract with TransCanada Corporation ..."
The Premier is now misleading people on what was knowable between October 2010 and September 2012. Tom Adams' Gas Busters work tells us what was knowable was the cost the government was willing to pay, and that the costs were hugely inflated to avoid the embarrassment of writing a cheque and the bigger political problem of allowing the settlement to be determined in court. So the original negotiating position was the full cost of building the plant, with the stipulation that there was no cheque (ie. no accounting for that value being the settlement). The Ontario Power Authority (OPA) then appears to be looking for intelligent alternatives (where bids could be fixed to get TCE the contract, but ... intelligent alternatives). Worse, the $40 million is the "sunk costs" - the rest is damages/profits/hush money ... whatever one wishes to refer to the amounts in addition to sunk costs as, the amount was roughly known from nearly day one. We can expect that both the OPA and the government will be named in any action. We also understand that TransCanada's plan is to "name names". Political staff were involved in initial discussions with TransCanada about the decision not to proceed with the plant. 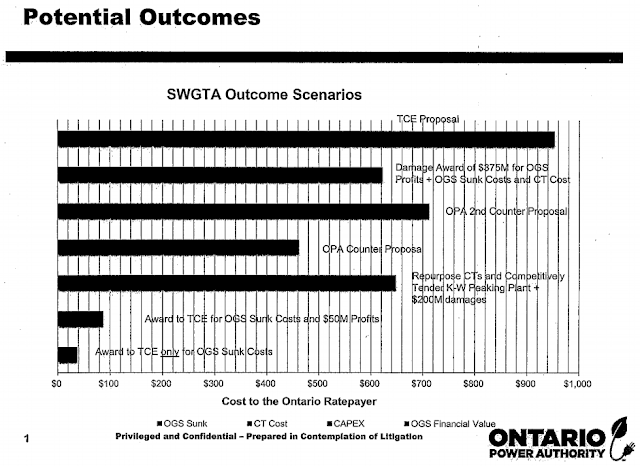 One outcome of that threat was that by the summer of 2011, the OPA was pushed out of the settlement process; OPA Chairman Jim Hinds wrote Infrastructure Ontario [IO] "took over negotiations, they changed the envelope to Lennox..."
That cleared the way for an entirely political solution. The newly released, heavily politicized, "Long Term Energy Plan" contains sparse references to the OPA - the body responsible for planning in Ontario. The $1+ billion political resolution moving the Oakville Generating Station out of Oakville will pale in comparison to the damage being done by this Premier ... and her Chiapetti. 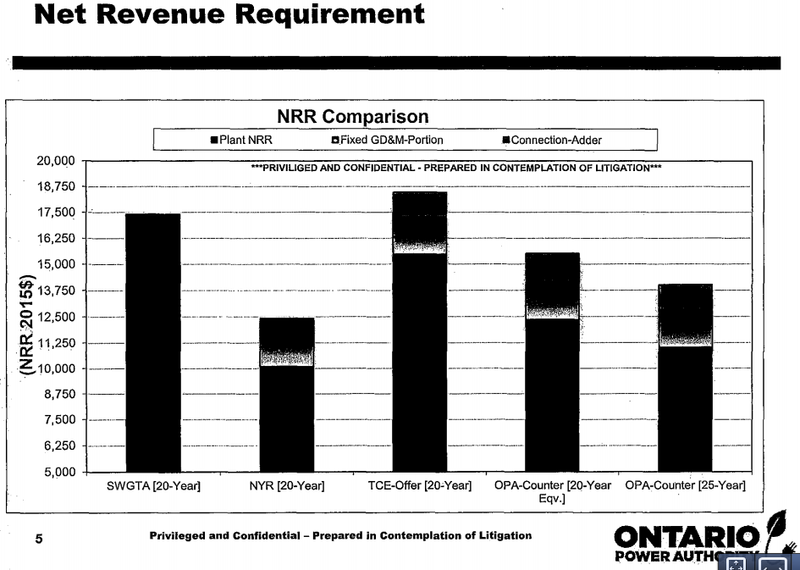 There's much discussion earlier in that .pdf file on Net Revenue Requirement (NRR's), with the dollar value of the settlement obviously being hidden in the NRR. 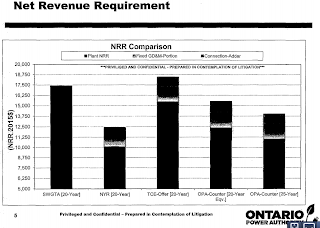 The final agreement seems to contain an NRR closer to the OPA's negotiating position, but the gas contracts and initial exchange of money (related mainly to the turbines) may push the value up to TCE's, and the government's, ~$1.2 billion value.